What Would Be My Cardboard Testimony? This morning I woke up early and had some quiet time to read and pray before the boys get up, the house gets noisy and life starts around me. I was just sitting here on my sofa praying a simple prayer - Lord speak to my heart through Your Spirit in me leading me to what You want me to focus on today- not just while I read my Bible but all throughout my day. A close friend is struggling through a very hard time with her teenage daughter. I have been that daughter. I have broken my mom's heart and her trust. Although our stories aren't exactly the same, her story has brought me back to mine. Today I sense Jesus wants me to think back, to remember where I was when I was searching - before I knew Him. To completely rewind my thoughts and my memories 19 years back. To remember that aching, lonely, empty feeling of being lost and to think through the details of how He rescued my heart. He used this powerful video clip Micca had on her blog last week. It draws me back. It leaves me speechless and so aware of where I was and who I'd be without Christ's rescuing, redeeming love and His transforming power in my life. Please take 8 minutes to watch it and ponder the amazing grace of our rescuing God who called us out of darkness in to His Light so we can tell the world about the Love that found us! But also so we can remind ourselves again and again of the hope we've found in Him. This is not a drama. There are real-life story clips. My cardboard would read: Lost, empty, confused, suicidal young woman with no hope or direction. My other side would read: Found by God, and filled with His endless hope, unfailing love and unconditional acceptance. After you watch the clip, I'd love to know - what would be your cardboard testimony? Lysa invited me to start running with her a couple years ago. I tried it...once...when we were away on a writing/staff retreat. I nearly died! That girl can run for miles and miles and miles. Now you need to know - we were in the mountains where there is not enough oxygen to breath when you are just walking let alone running. And there are lots of hills. I'll tell ya she just about killed me!!! I was gasping for air while she carried on a full-blown conversation. I had to stop running to answer to her questions. I never ran with her again, although she did invite (bug) me again and again. Finally, she gave up. 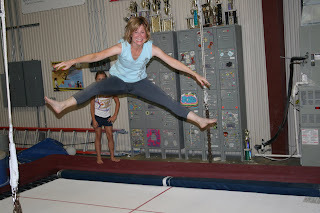 However, a few short months later she started inviting (bugging) me about going with her to adult gymnastics class. Now why would I do that? She was talking about bars and beams, pull ups and push ups. It sounded very painful and dangerous. Although I was quite impressed with her Olympic-sized commitment and her new found muscles, I was not a bit interested in having some of my own - not with all that work. "There's no way!" I told her. Fast forward two years. My husband decides that although he has arthritis he is going to run a half-marathon. He asks me to run with him in Knoxville, TN. I remind him of the oxygen and hills situation and basically say - no way, no can do. 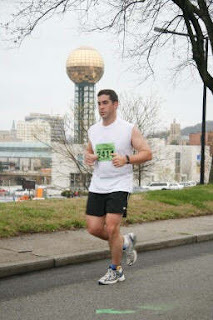 He trains for months and runs 13 miles straight, up and down the hills of Knoxville. He comes home and tells me he is praying that I will start running with him - like I used to do when we first got married. Oh great! Now I'm feeling all out of shape and like a wife who's husband is looking for some recreational romance and I'm just a slug. So now I have three people who I love to spend time with asking me to stretch my schedule, my faith and my muscles in ways I never have before!! And something crazy in me wants to. Somehow I feel God calling me to do that which I cannot do! 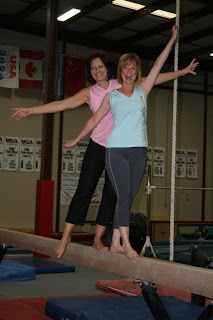 Last Monday I decided to go with Lysa to gymnastics. And I talked my very sweet friend Holly into going with me! I told her I'd do anything for her if she'd go look like a fool by my side. Oh my gosh! It hurt so bad I could barely move the next day but oddly I felt great afterwards - well in my mind anyway. I had tons of energy and slept better that week than I had in months. I've been going now for over a week - and I CAN do it! And it's really making me feel better. I have more energy, less aches in my back, shoulders and neck and my chronic headaches are gone! Here is a photo of us this morning at the gym. That white blob in my mouth is bubble gum - it helps me balance. Here is a lovely shot that truly reflects the pain I am enduring - for the loves of my life! But with the pain I got a little gain! we've decided to start a new division called P31 You Go Girl Gymnastics. 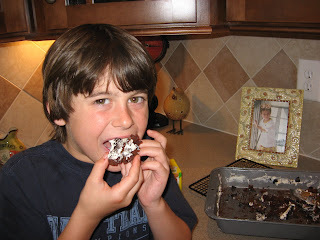 For more fun photos, click here to go to Lysa's blog . Okay, so guess what else? Last night JJ signed me up for the half marathon in Kiawah - without force! I committed to train and run with Melissa and JJ (he's got a friend running the whole marathon with him). We ran our first two miles this week and it was just like when we first got married - just like he thought it would be. This weekend our family is going to the mountains for some tubing down the river! Now that is my kind of recreation. Have a fun weekend! I'm praying for all of you to be, do and become all that you never thought you could be! Don't you just love how David and the other Psalmists prayed? They were honest about their feelings, with themselves and with God. They told God what they were struggling with, even when it wasn't pretty! They knew how to pour out their hearts to Him (Ps 62:8). But one thing I've noticed is that often they praised God first, and then they opened up their hearts and their mouths to express their emotions and distressed thoughts, even complaining at times. Afterwards, they went on to praise God again despite their troubles. Praise is another key element to releasing God’s power in our prayers. God’s Word tells us that He “inhabits the praise of His people.” I have experienced God's presence in a powerful way as I worship Him in prayer (through praise) by focusing on and thanking Him for who He is. Although I know it, I need to be reminded of it again and again. It's completely changes my perspective in prayer. One way that I've experienced the power of praise is by praying scriptures of praise penned in God's Word. I've also enjoyed praying God's Word woven together through devotions in a little book (31 Days of Praise) that was given to me in November 2000. I wanted to share with you one of my favorite devotions from it and lead us in a prayer together. Will you pray this with me? My heart rejoices in You, Lord, for You are my strong shelter in times of trouble and danger and stress, my hiding place to whom I may continually resort…My Father who lovingly provides for me…my Shepherd who guides and protects me…my Champion who upholds my cause as His child and defends my highest interests…my Bridegroom who delights in me…my God who is mighty to save, who rests in His love for me and rejoices over me with singing, with shouts of joy. You are my inheritance, my share in life, the One who satisfies my longing soul and fills my hungry soul with goodness. I praise You for Your love and Your wisdom. You are too wise to ever make a mistake, too loving to ever do anything unkind. You act on my behalf, accomplishing what concerns me and fulfilling Your purpose for me as I call on You. Thank You that You love me deeply and tenderly. You are compassionate and gracious, full of loving kindness, ready to forgive, patiently considerate, and generous beyond imagining. You desire my love and rejoice to do good things for me. You delight to give me the desires of my heart as I delight myself in you. How precious is Your love to me O God! I sing for joy as I take refuge in the shadow of Your wings! Paragraph 1: Ps 27:5, Ps 71:3, Ps 91:1-2, Matt 6:25-26, Ps 23:1-3, Is 62:5b, Zeph 3:17-18, Ps 16:5-6, Ps 107:9. Paragraph 2: Ps 57:2, Ps 138:8, Ps 86:5, Ps 103:8, Matt 22:37, Jer 32:41, Ps 37:4, Ps 36:7, Ps 63:7. I love reading your prayers and your praises friends. They are so powerful. I just love the verses God has given each of you. I can't imagine how much He must delight in how we're seeking Him with one an one another and for one another! WOW! 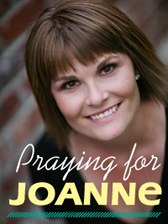 When I posted my Power of a Praying Friend blog in the wee hours of Friday morning, I had no idea that so many of you would join me. I hoped that 25-50 would commit to pray, but boy did God have bigger plans. As I write this post, there have been 335 comments with prayer requests and prayers for each other. I LOVE praying for you and reading how you are praying for each other. It's a beautiful thing to see women from all around the world gather in Jesus' Name to encourage, support and carry each others' burdens. My prayer is that your courageous renderings of your heart desires and personal needs will forge friendships despite miles that separate us because of God's Spirit that connects us! Today I wanted to share about the power of praying God's Word. My prayers used to feel kind of flat. I didn't really know what to say and I stumbled over my words a lot. I especially didn't know what to pray when I was struggling or when friends were going through really hard times. I wanted my prayers to be filled with power, hope and faith to believe that the God I was talking to was big enough to accomplish the things I was asking for. Soon after I became a Christian, a friend who was mentoring me taught me the power of praying God's Word. She shared that when we pray God's Word, we pray God's will. I really liked that idea. It gave me a sense of confidence and God's direction. So, what is a verse you could pray for your prayer partner? If you want to find a verse on a specific topic, go to this page on BibleGateway and click on Keyword in the left margin, then type in a keyword you want to search on. (For instance, if I had typed in hope, the two verses listed above would have come up.) When you type in your keyword and hit enter, several verses will come up and you can choose the one that best fits. Then come back and post the verse and/or a prayer with that verse in the comments area below for your prayer partner. Remember, there is no certain way to do it. What we want to do is get into the Word, and get the Word into us, and into our prayers so we can experience the power of Praying God's Word together. Please pray that my husband will find God-centered, gainful employment soon. He has been out of work since November and he is feeling quite defeated at this time. Pray that our family's faith will remain strong and that we continue to trust in Him each day to deliver us through this situation. We pray that my husband will find a job that he will glorify Him through. C-mom, I don't have your email. So I hope you find this. If not, I'll have RIG choose another winner on Wednesday. We would love to hear how God is answering our prayers, so be sure to let us know if you have a praise to share. I hate open heights! I can’t stand balconies, glass elevators freak me out, and when I am driving across a bridge, you’ll find me hugging the dividing rail along the inside lane. Some friends tried to help me conquer these fears by inviting our family to join them one Sunday afternoon at Inner Peaks Climbing Center. I cringed at the thought of it, but JJ and our boys really wanted to go. So I caved in and agreed to a family “outing” inside this huge rock-climbing center. When we entered the doors, my heart stopped beating as I look up at the highest peak – 25 feet! The instructors assured me that a web of ropes, harnesses and carabiners would hold me tight. Before I could say “no thank you,” I was strapped in and signing an injury waiver. I played it safe and stayed on the lower peaks. Towards the end of the day, our friends John and Laura challenged their eight-year-old son Steven to climb to the highest peak – promising $5 in tokens and a cone of ice cream at arcade next door if he would touch the bar at the top. Steven was afraid of heights, too, but he loved a dare. The promise of reward, mixed with the challenge and faith of his father evoked courage in Steven. I watched with admiration as that little guy started the climb with confidence. He made it to 15 feet, then 20. But as he inched past the next face of the wall, he saw just how far he had to go before reaching the bar at the top. In fear, he looked down with tears and said he couldn’t do it. Then he cried out for his daddy’s help. By this time, John was holding their very tired 3 yr old, and Laura was feeding their very hungry baby girl. I don’t know where my brave husband was, but as I looked around I realized I was the only one standing there who could do something. I said a quick prayer that God would help me and that Steven wouldn't give up and start repelling his way down before I got to him. In no time, I reached the 20 foot marker. I crossed over the peak and up beside Steven to encourage him, reminding him of how far he’d come. Using my words and my confidence I focused his thoughts towards a higher goal, an inner peak, a reward that would be much greater than ice cream and game tokens – the reward of getting to a place he had stopped believing he could reach. My fear was gone. I had stopped thinking about me long enough to focus on helping someone else reach their goal and overcome their fear. Strangely enough, in that moment I overcame mine, and reached a peak of my own. In that moment we take our eyes off our fears, our doubts, our struggles and set them on someone else's needs. There we find faith to believe the power of God’s Word for them, and somehow our confidence in God's promises and power are true for us in a way they may never have been before. That is the power of a praying friend! Today, I invite you to join me in a conversation with God and some girlfriends so that we can experience what happens when women pray – for each other. This is your chance to share a request (a need, a hope, a desire) that you want someone to pray for you for this week. In return, you will pray for one person for the next week, too. And because I love to share with friends books that draw me closer to Jesus, those who participate in our “conversation with God” will be part of a drawing next week for a new book called “Dear Jesus.” It is filled with devotions and scriptures that capture the heart of God’s response to every woman’s longings and intimate struggles. Click the word “Comments” below my name on this post (just under the 2nd green box). Type in your prayer request in the white box. Include your first name and where you are from. (If you don’t have a blogger account, you can sign in as anonymous. But please include your first name at the end.) After type your request, click enter. Your comment will post. Read the prayer request/comment above yours and pray for that friend. Copy and paste it in an email to yourself as a reminder to pray for your new friend throughout the week. On Monday, I’ll post about the power of praying God’s Word and share some of my favorite scripture prayers. Wouldn’t it be neat to find a Bible verse to pray for our prayer partner and post it in Monday’s comments? I’ll share how to do that. There were two people in blessed in my story. But I never would have experienced what God had for me to give or receive that day if Steven hadn't asked for help. I pray you will experience the power of a praying friend by promising to be one and allowing someone else to be one for you today. Be sure to click "comments" just below this box so that others see your prayer request and you find the request you are to pray for, too. © 2008 by Renee Swope. All rights reserved. I had to pick more than one! Thank you so much for the gift of your comments these past two days. They're priceless!! I've read each one, and I've thought about how much valuable time it takes to ponder these questions, look into your heart and then decide if you want the world - or at least a few in my world - to know your thoughts. Well, with all that sentiment in my heart, when it came time to choose a winner, I just couldn't stick to only one give-away. It happens every time! But since the Swope budget doesn't allow for two $20 gift cards this week, I decided to give the 2nd winner a new devotion book I am starting to read called "Dear Jesus" by Sarah Young. She also wrote "Jesus Calling" which is one of my favorites. A small book that speak volumes of God's truth and love. Karan - kstandley@windstream.net for a copy of Dear Jesus, by Sarah Young. Congratulations Helen and Karan. And to all of you- thanks!!!!!! God is using you to make a big difference in others' lives. I think your comments are the greatest ministry that happens on my blog! Be sure to stop by tomorrow. I have a devotion running at P31 about the power of praying friends. I'll be announcing another give-away and the chance to be part of a special prayer circle where we'll be connecting with God and our girlfriends in a powerful conversation! "Nothing is going to get better." Those are some depressing thoughts, aren't they? But oh how quickly they weasel their way into our thoughts and disguise their voice to sound like ours. And sometimes these thoughts actually become our own. These are the whispers of doubt that casts a shadow of hopelessness over our perspective, and can so quickly block the promise of God's power to make things different, to make all things new. "You might as well quit." "Go ahead and give up. Just walk away. " I have found that doubt and hope cannot live in my heart at the same time. Without the possibility of hope for something different, the possibility of change - doubt wins every time. But I have also discovered that with Jesus, all things are possible and the most likely place for change - is within me!!! A journey beyond the shadow of doubt will require faith and hope! So many times we are afraid to hope, afraid to believe, because we don't want to be disappointed. But hope and faith will be required in this journey because "hope looks ahead and keeps desire alive." Doubt on the other hand, looks down and refuses to take a next step forward. "Things are about to change - see I am doing a new thing." "I am working all things together for good, because you love me and are called according to my purpose." "All things are possible for those who believe." As I pray and prepare my heart to write a book to help me and others LIVE beyond the shadows of doubt and experience the life-altering, hope-infusing, promise-keeping power found in the shadow of the Cross, I want to know where you'd like for us to go along the way, and where you hope we will end up at the end. What would you want to see covered in a book like this? Where do you hope to be on the other side of doubt? In other words, what would you like your heart, your thoughts, your every day life to look like after you have taken your journey from the shadow of doubt into the shadow of the Cross? I value your thoughts and really ponder your insights when you share them. You bring such amazing perspectives, and your answers will give me direction in knowing what will be the most valuable topics to cover in this book. So, please let me hear your thoughts by clicking "comments" below. Be sure to list your email so I can get in touch if you win. As a thank you for all that you give to me, I want to give you the chance to receive something in return. Your comments on this post (and Monday's post) will qualify you for the $20 gift card to Starbucks, Target or Wal-Mart (winner gets to choose) give-away tomorrow. Since this post is going up later in the day, I am going to bump the drawing time to Thursday at 9pm, EST, to give more time for comments and chances to win. Where would you like to spend $20? Ok, so here's the honest truth. A bunch of things came up today that I embraced as great excuses for not writing. Why? Because I knew I was going to tell you something that if I tell you, then I’ll have to follow through and do it. And that kind of accountability made me want to change the plan. It’s that whole stinkin’ doubt thing – you know those thoughts that make you question if you can really follow through on something you feel called to do. So I am just going to say it…I sense God is calling me to write a book – about DOUBT!!! Well, I never ever thought my first book would be on doubt, and honestly I don’t want it to be becauseI’ll be tested in it again and again. Yet, God has allowed doubt to be a struggle most of my life which allows me to write about it from personal experiences and from a personal expression of His life giving power that has been available to me when I BELIEVE. I pray that these last few posts have somehow encouraged you in your journey, in seeing God's protection, preparation and process of calling in your life. My hope that is in sharing my story you will see more clearly into yours. This week I am going to work on my book proposal and I really want you my bloggy friends to be part of this process. Lysa was just asking me the other day if I had thought about getting your input. We talked about how doubt has cast its shadow on all of us, but it affects us differently. So, this is where you come in - and that great give away I promised! Here is the first thing I'd love to know: How does doubt affect your life? You can post your answer by clicking "comments" below. Please list your email so I can get in touch if you win. Also, be sure to come back as I'll be posting other thoughts and questions through Thursday morning. Soon after I poured out my dream as an offering to God in 2003, I asked Him if I’d ever write a book. I sensed God say ( an impression in my heart ) that I wouldn’t write a book until after I turned 40, and there would be a child. I questioned if it was really God speaking. I was very content with 2 kids so I hoped I’d imagined that part. Every once in a while during the following years, I got lax with birth control just to see, but nothing ever happened. So I went on with life. Four years later, I turned 40. No child. No book. During the in between time, I learned that when God calls us to lay something down, it's usually because He has something else to give us. When God told me to lay down my dream of writing a book, He called me to pour my time and my heart into others’ dreams. I did so by investing in the P31 team, helping them become better speakers, leaders, and writers. It has been so sweet to watch many of their dreams come true and to see God use them in such powerful ways to change lives! I also felt called to invest more of my time to serve alongside Lysa, LeAnn and many others to help P31 grow. In my personal ministry, He called me to dig deep into His Word and focus on my speaking messages instead of any new writing opportunities. I see in a whole new way that when God calls us and we obey, He blesses abundantly. He grew my personal ministry more than ever, while I was focused on growing others. And all of it was part of what He was calling me to do then and what He was preparing me for next. Only GOD! Beth Moore once said that, "We lay down our lives and the world's call to receive something far more intense - God's call. God intends the time we spend awaiting further enlightenment and fuller harvest to bulge with relationship." During the past five years God has been refining and bringing depth to my character and my relationships. These have been some of the hardest years in our marriage and in ministry. But it has been the richest seasons of intimacy and relationship with God, with my husband and with my friends. Like cream in the middle of an Oreo cookie, there is always something so sweet about the in between! Now here is the funny thing. I am now 41 and a half, and God called us last Fall to start the process of adoption, 9 months before He called me to start writing a book (see above post). I promise I did not make this up! It became a season of God reminding me of who HE was and His preeminence in my life. He showed me that I had given my heart over to people’s opinions. I had given glory to another. It was time to tear down some idols - my performance, unrealistic expectations of perfection, others' approval, and counterfeit value attached to my accomplishments. Each time God took an idol down, I’d ask Him to put Himself in that place where He belonged. I also asked Him to give me a hunger and thirst for Him that nothing and no one could satisfy – and He did. His Word was like fresh water to my soul. I couldn’t get enough of it, or enough of Him. My time with Jesus went back to being like it was when I first became a Christian 13 years before that. We were back to the honeymoon phase and I was loving it! Then God did something crazy. In Spring 2003, God had Focus on the Family call and ask me to re-submit my proposal. Just when I’d gotten to a place of contentment, peace and not even thinking about writing a book, they called! I was excited but prayerfully reserved. I submitted the proposal with additional chapters and ideas. It went to publishing committee, they showed more interest and asked for revisions. And while I waited for them to come back with a decision, I sensed God telling me to lay it down – to walk away. It was the strangest thing. One day I was driving down the road and it was as though God flashed neon yellow lights in front of me spelling W-A-I-T. When he got what he wanted he poured it out as an offering to God. As crazy as it seemed, I knew God was asking me to trust Him and to wait. And as hard as it was, I wanted to be please Him more than anyone else. I remember calling my acquisitions editor at Focus, and saying “I know this sounds crazy but I feel like God is telling me to wait. It doesn't make sense now, but I know there's no safer place to be than in the center of God’s will, and that is where I want to be.” He agreed graciously and we promised to stay in touch. In the months that followed, Focus on the Family decided to make drastic cuts in their publishing department and reduced their efforts on book projects significantly. Who knows what would’ve come of my book? God does. Mining for Gold in the Heart of Your Child eventually became a character chart and CD that we self-published. As of today close to 2000 copies have made it into the homes of families across the world. It’s been 5 years since I poured out my dream as a drink offering, and Jesus has poured out Living Water into me in ways I cannot even begin to describe. I’ll share more on Monday about what’s been going on for the past five years. I'll also share something God spoke to my heart the day after my decision, and what's seems to be the next step in this crazy journey of mine. I would love to hear your thoughts. And if you want to share, I'd love to know if there has ever been a time you had to lay down a dream? Is there a verse that has helped you know what God wanted you to do? Update: Oh my, I'm trying to recuperate from a sugar coma. I ate too many sweet meatballs, cream puffs drizzled with chocolate, along with too much cream cheese toffee ball on chocolate graham cracker sticks and sherbert punch! 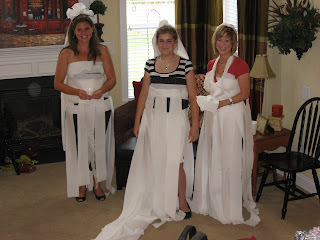 Here is the bride (in blue) along with my girlfriends who helped with the shower. (Me, Bev, Sharon, Erin (the bride) and Mandy. 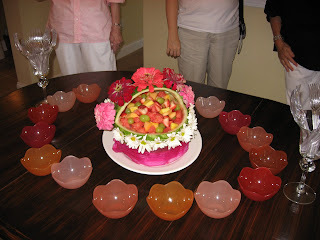 Look at this amazing watermelon fruit basket Sharon made. Here is one of the bouquets I got at the Farmer's market for $10!!!! Can you believe that? 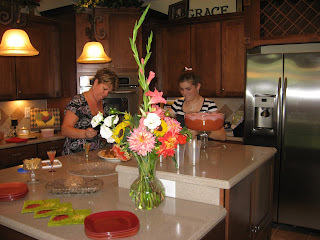 And behind the flowers you can see the beautiful raspberry punch Bev made. Mandy and her daughter Mackenzie are back there working on their yummy peanut butter white chocolate Cheerio clusters. We had a wedding gown designer contest. Each design team got three rolls of toilet paper, 6 paper clips and 8 minutes to design a dress. Mine came with implants! 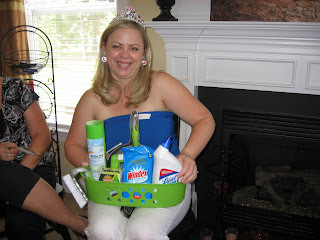 And we played "The Price is Right" where the women had to guess at the price of the items in the cleaning caddy (notice the princess tiara for Cinderella). Whoever guessed closest to the total cost for everything won a prize. We had so much fun! It's been years since I have been to or hosted a bridal shower so it brought back great memories and lots of girly stories. After they all left I came to write, but beforehand I decided to read through more journals. Wow, it's more than my heart can contain or tell about at this moment. My hands want to type, but my brain cells are seriously lagging behind. I think I need some coffee and I'll be back. Of course it will be here tomorrow so I am sure you have better things to do than wait for me :-). Remember, Monday I am offering a great give-away and another part of what is next in this story. I want you to be part of it! My post with the rest of the story will be up later today. 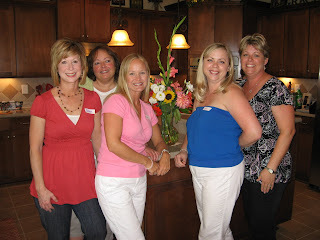 I am hosting a bridal shower for my friend Erin, at my house at 2pm. The house is clean. The food has been purchase, and the tables are set up. I thought I'd be able to write this morning, but as I looked around I decided I still need a few things to make the party all "pretty." So, I'm off to the Farmer's Market where I heard they have beautiful bouquets of flowers for really low prices. I have never been to our Farmer's Market so this will be an adventure. Have a great Saturday and I'll be back soon! I've been reading through old journals this morning, tracing my steps with God over the past several years. Thank God for journals, because I never would have remembered the details of where I've been in my spiritual journey and how God met me in each place, revealing my heart to me and His heart towards me. I was sharing with Lysa how perfectly timed her P31 devotion was yesterday about running toward our dreams, using the parallel of running and writing a book. It really spoke to me because I avoid both of them for one reason - running and writing are hard and cause pain that I'd rather avoid! I started to write a book a six years ago (May 2002). It was based on a parenting concept I'd implemented with my kids called "Mining for Gold in the Heart of Your Child." I presented a proposal for the book in June 2002 to Moody Publishing and Focus on the Family. Soon after, I received a letter from Moody declining my proposal. I hadn't felt a connection with them so I wasn't completely disappointed, but it opened a wound in my heart where the fear of rejection had been festering. It was as though the enemy stepped off the page of that letter, pointed his finger in my face and shouted, "You will never be good enough. You may be on God's team, but He will never choose you to do something this important. You'll always be a bench warmer." Those thoughts caught me off guard and made me weep! I hadn't even been rejected by the publisher I wanted, but I had gone ahead and done the job for them. As I sat on the floor crying, the Holy Spirit revealed to me that these thoughts weren't just from the enemy, they reflected deep beliefs in my heart, and also revealed a false image of my God. Then God whispered to my heart, "Renee, you are as valuable to me as Mother Teresa. You are as important as Billy Graham. I don't look at the things that man measures as worth. I look at your heart and I see a woman of great value who I love deeply." That day started me on a healing path. I wanted to know and believe this was really what God saw and what He felt about me. I needed His love, His perspective, His value of to be my enough, so that no matter what happened - HE defined me. Over the next few months I pursued the love of God with reckless abandon. I read the book of John again and again. I read the Sacred Romance - and through it God took my breath away! Over many months, He revealed so much about my brokenness and opened wounds so that His healing could come over me like never before. This was all part of the process Lysa talks about. A month or two later, I got a "letter of decline" from Focus. But amazingly I wasn't wounded. Sure I was disappointed but strangely, I was also glad. I knew I wasn't ready. I didn't want any other love or dream to whisk me away. I didn't want my heart to be that vulnerable to man's approval and God didn't either. This letter was God protection and God's perfect timing for His dream for my life. If He wanted me to write a book, He'd make it happen. In the meantime, I kept loving on Him and letting Him love on me. God continued to increase my passion for the message and for other parents, because it had changed my life and the whole landscape of our family's life. He opened doors for the message I hoped to wrap in a book cover by giving me opportunities here and there to share it at MOPs groups, Bibles Studies at my church, parenting seminars and church services. Today as I look back, I see God's process and preparation through assignments that were a better fit for me and His message, in that season of my heart's journey. The next summer, I was asked to volunteer as the coordinator for character development at my son's charter school. I was hesitant because I knew it would take time away from my dream of writing. But I sensed God calling me. In the end, I got to share portions of the message each month with over 200 kids, parents and staff at our character assemblies. The message grew and so did I. Later that year I was invited to give a keynote to the teachers and administration based on this Christ-centered character development concept. Six years later, I am sensing God calling me to write a book. I know many of you want to know how you know when God is calling you to write. Well, I can't wait to tell you! God did something amazing next in this story, that I'll share tomorrow (since this is getting so long). Also, I have a give-away you don't want to miss on Monday! But before you go, I'd love to hear what God is doing to draw you closer to Him as you pursue His dreams for you? Have you traced your steps with Him lately? Good NEWS I've been dying to tell you. But I couldn't because we haven't had internet, phone or cable in over 24 hours due to a very , very bad storm last night. I had an electrician and a bunch of boys at my house all morning playing and then went to Van's pool this afternoon, so I wasn't able to run to Panera to get some WI-FI connections so I could tell you what I've been wanting to tell you!! JJ's doctor called last night at 8pm and left a message for JJ to call him back at his office number. Then he added, "But it's nothing urgent. Again, it's NOTHING urgent." So, we translated that to mean that "the biopsy results aren't anything to be concerned about" - and that translation was confirmed at 4:30pm today! The doctor said JJ has "non-alcoholic fatty liver disease" and that is good news. There is no tissue damage, no sclerosis. He just has too much fat in his liver so he needs to lose 15lbs and cut back on fats. Which will be our next prayer journey. But let's just celebrate for now! The doctor said he'd fight hard to make sure the insurance company notes that there is no reason to be concerned and hopefully that will bring the rates down significantly. That is our prayer because we need to increase his life insurance as we increase the size of our family. Girlfriends, thank you so much for "being there" with us. Truly, you have been like next-door-neighbors the way you have cared, checked on, and prayed for us. I know God heard you and answered your prayers. We have had such peace while we waited, which we fully attribute to the gift of praying friends and family. So, from the bottom of our Swope hearts, THANK YOU!!!!!!!!! I woke up this morning with a looong TO DO list rambling through my head. I hadn't even opened my eyes before the TO DO munchkins started squeeling for my attention. My TO DO list had so many items on it that I had to separate them into categories with sub-categories. The bad thing is that I didn't have them all written down. They were doing the TO DO dance in my head like little children begging for breakfast at my bedside. It was not a good way to wake up and start a new week. I didn't want to give in to their whining so I decided to ignore them until they could talk to me in a calm and peaceful voice (which would require a good cup of coffee and some Jesus time). So, instead of jumping out of bed in a flurry and writing down my list with sub-lists, I decided to turn over and start a new conversation with someone who would talk to me in a calm and pleasant voice. "Good morning Jesus. How are you today?" I whispered. Then I laid there and smiled as His sweet peace came over me. Why don't I do this every morning?! I thought. It was such a different way to start my morning, talking to Jesus before my eyes even opened. Instead of praying for His help to get it all done, I soaked up the gift of being able to talk to my Lord. I took my anxious heart and tenderly placed my hope in Him. I tried to hear His thoughts before I tackled mine. Of course, I acknowledged that there was no way I could get all my TO DOs done but I knew He'd be ok with that, and if He'd be ok with it, then I could be ok with it. Well, I've had my coffee and my Jesus now. And though I did have to get out of bed eventually, I am continuing to rest in Him even as I do laundry, clean house, cook breakfast and lunch, make calls, check emails, and plan our week. But instead of praying for help, today I am reminding my self of where my help comes from. I would love to hear how you manage your TO DO list! Please do tell. PS. JJ should get the results on his biopsy early this week. I'll post something as soon as we hear back. 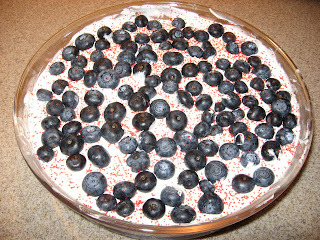 Also, I added the recipe's to my July 4th post if you were one of the friends asking for them. 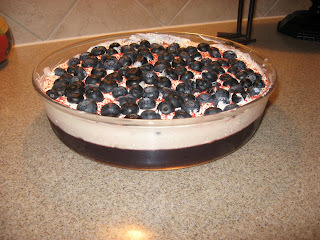 Sugar-free cherry jello with light cool whip, blueberries and red sprinkles. 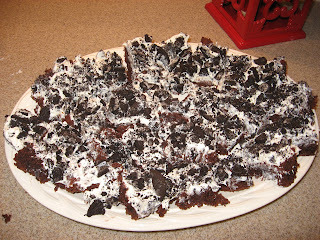 Rich because it's made with chocolate brownies on the bottom, covered in frosting and topped with Oreo Cookie Crumbles. Famous because they are ooey and gooey, which makes kids love them! Recipe added: Prepare brownies according to box instructions in a 13x9 inch pan. Once they are done, let them cool completely. Once they were cooled, I spread a thick layer of vanilla icing (I used Betty Crocker whipped vanilla icing that was already made) over the pan of brownies. Then I topped them with Oreo cookie crumbs. I bought the cookies and crushed them myself in a ziploc bag. I cut them into squares and put them on a platter because it would have been very messy to try to serve them from the pan at the party. They were delish! So, are you celebrating the 4th of July? If so, how and where? Are you making anything special? If you don't live in the U.S., I'd love to hear about your country's traditions and recipes, too! I wrote the email almost as an apology. I needed prayer but I was hesitant to ask for it. I didn't want my request to be a burden. After all, the friends who would be reading the email already had so many burdens on their prayer list: illness, job loss, death, cancer diagnosis, stress, exhaustion, relationship strains, overloaded schedules, etc. Did my "need" rate high enough on the urgency Richter scale? Was it bad enough to ask for prayer or should I wait to see how things turned out before I let people know what was going on? My email started like this: "I hate to add to the list of needs we all have, but I really need prayer for my sweet husband, JJ." Then I hesitantly gave more details and, after five minutes of hemming and hawing about whether to wait or not, I finally hit send. Within ten minutes my friends who were on their computers started loving on me through prayer. Not only did they pray, they thanked me for sharing what is going on and for letting them be there for me. Charlene shared a story about a friend who'd been through something similar. Glynnis asked questions and made some great suggestion. Micca cracked a funny joke and made me laugh, which I really needed to do! The list goes on and on of how they each loved me in a unique way. Throughout this week, they've continued to check on me with calls, emails and conversations. As I was about to turn off my computer tonight I got an email from my sweet friend Amy saying, "I've been lifting prayers heavenward for your family since your last email. Know that you'll be in my thoughts and prayers tomorrow. Let us know as soon as you hear results. We're all in this with you, friend." Her last sentence, "We're all in this with you, friend," touched my heart deeply. I am not alone. I am so glad I didn't listen to those lies about being a burden! Prayer isn't about putting burdens on others. It's about inviting them into our conversations with God. It's about letting those we love walk with down a path with us that we were never intended to walk alone. Do you ever feel like your need for prayer is a burden on your friends? Why do we do that as women? Having friends pray for us is one of God's sweetest gifts but it's up to us to ask for it, and that can be hard. If you're still reading (since this has become a very long post) and wondering what is going on, tomorrow we head to the hospital at 8am for JJ to have a liver biopsy. Due to our upcoming adoption, JJ recently applied to increase his life insurance. The blood test results showed that his liver enzyme levels are severely elevated, making the insurance cost go from affordable to ridiculous! Three years ago he was having a similar problem but tested negative for hepatitis, sclerosis, etc. He felt fine and didn't want to do a biopsy so he didn't. On the Thursday of She Speaks he went back to a liver specialist and was scheduled to do a biopsy tomorrow. I think the Lord has allowed this now because he wants us to address it. So, if you want to join our conversation with God, we are praying that the doctors will be very careful, the needle will only hit his liver, there will be no internal bleeding, he won't get any infection, and most of all that there is nothing major wrong. We're praying that it's only a "fatty" liver. I know, I never thought I'd be asking for a "fatty body part?" (as Micca would say). Also, how can I join your conversations with God today by praying for you? UPDATE: I am at the hospital and JJ's biopsy procedure went well. He's just a little sore from the needle and sleepy from the pain killers. He was awake the whole time, and said it was so weird to feel his organs move. I begged him NOT to give me any more details! Thanks so much for your prayers. I have total peace about waiting for the results. Most of all, I am thankful there were no complications today. There is so much power in prayer! We receive that power when others pray for us and when we pray for them. Don't you dare think I am too burdened with my life to pray for you. I am not!! Really, we're totally okay! I love to pray for others. As I wait for JJ to be released in a few hours, I am including each of your requests in sweet conversations I' m having with my Father today.